Darlene Zimmerman is at it again with her delightful Lazy Daisy Baskets. The third in the series, the collection is full of all the sweet prints and blenders that make her fabrics a favorite. Fabrics are shipping to stores this month, but you can download the free pattern now. it works perfectly with the redwork fat quarter bundle that is available, too! Because Darlene seems to believe that bigger is better, she also designed (and made!) this beautiful Pinwheel Posies quilt (finished size 68" x 82") using the 30s colorstory fat quarter bundle. Look for Darlene's Lazy Daisy Baskets at independent fabric retailers this month. You can find more about Darlene's patterns, books and tools at her site: FeedsackLady.com. Jennifer Sampou is back with a beautiful new collection, Shimmer, characterized by delicate pearlescent accents. It is availabe in three color stories: Stone, Vintage and Steel. We're excited to begin shipping the fabric to independent quilt retailers soon and next week, Jennifer will be joining us to kick off her Shimmer blog hop. Come back on April 1st (no joke!) and see what she has in store for fans, find out who'll be showing off their Shimmer projects and see inspiration galore! For a sneak peek, check out her lookbook below. Known for her variety of reproduction fabrics, Darlene Zimmerman is back with another collection, this time pulling prints from the late 1800s and early 1900s. We wanted to find out more about the colors and designs she chose for Classic Minis, so we asked her to fill us in. And that she did! Full of information, we thought maybe you'd like to hear about Darlene's inspiration, too. "These are designs from the turn of the century (late 1800s, early 1900s). The colors and designs are typical of that period of time. "Indigo blue prints were very popular all through the 1800s as they were a fairly colorfast dye. Indigo is a native US plant, and one of our first exports! Indigo is still used today to dye our blue jeans. And just like our blue jeans eventually fade, they still stay a nice true blue. Quilters knew they could rely upon the indigo blues to keep their color. Usually the blueprints have a reverse printed white design; only occasionally were other colors used with indigo. "The black and gray prints from the late 1800s were also popular for quilt-making. They weren't as colorfast as the indigo dyes, but could be relied upon. At this period of time, Queen Victoria had lost her beloved husband and went into mourning; wearing black and gray. It seems the whole world went into mourning with her, as wearing black or gray became very fashionable. Black is usually combined with white to make the gray "mourning prints" which were so popular during this time. "There are two different reds in this collection. The bright red is referred to as "Turkey Red", as this particular dye process (which was very involved and time-consuming) originated in the country of Turkey. It was also prized by quilters as Turkey red could be relied upon to be both color-fast and would not bleed. It often cost double the price, but the cost was worth it. "Classic Colors" quilt (51" x 60") Download the FREE pattern, designed by Darlene Zimmerman, from our Patterns section at robertkaufman.com. "The second red is a burgundy red, and that color wasn't seen until the last quarter of the 1800s. 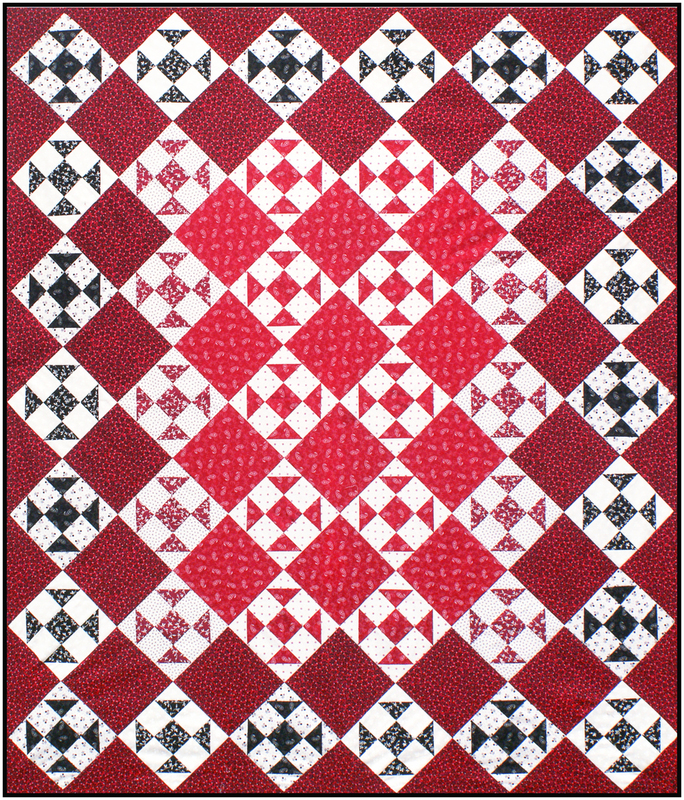 It became quite fashionable then, and it's not uncommon to see both colors of reds being used in the same quilt. "The light prints are called "shirtings" and were popular backgrounds for quilt blocks at this period of time-- used much more frequently than muslin or plain white fabric. Shirtings are white prints with a sprinkle of color. They would have been used for making "waists" for women (we call them blouses now), and shirts for men, or clothing for children. "Broad Stripes, Bright Star" quilt (76" x 76") Download the FREE pattern, designed by Darlene Zimmerman, from our Patterns section at robertkaufman.com. "The indigo blue, the red and burgundy prints and the black and gray prints would have also been used for clothing. Men, women and children mostly wore dark clothing for everyday use as it was the most practical. Back then, they didn't have automatic washing machines, so laundry was done on a monthly basis, and the same outfit would have been worn for a week! This was also during a time when one only took a bath on Sat. night (in the wash tub) whether one needed it or not. So, as you can see, dark clothing was very practical. "The indigo blue and white quilts or quilts made with Turkey red and white are classics, and never go out of style. They will coordinate nicely into any decor from country to modern to shabby chic. Combine the red, white and blue prints and you have a patriotic look, or another type of classic quilt. These prints can also work into other collections nicely as they are truly 'Classic' prints." 'Bursting In Air' quilt (62.5" x 72") Download the FREE pattern, designed by Darlene Zimmerman, from our Patterns section at robertkaufman.com.